Some intriguing titles include nora chipaumire’s punk salute to Patti Smith and Zimbabwe, Neal Medlyn’s investigation into Pina Bausch and his years as an “untrained dancer in New York contemporary dance,” NIC Kay’s solo performance inspired by queer ballroom and Butoh, Adrienne Truscott’s “dance about dance without any dance,” Claire Cunningham and Jess Curtis’s physical delve into the seeing and perceiving of bodies both disabled and not, and of course, more. This year’s COIL Festival is a bit less staggering than other festivals this season, offering a mere six shows spread out over nearly a month. Like American Realness, the bulk of them are contemporary and/or experimental dance-based, save for Jupiter’s Lifeless Moons, a surreal musical creation by Dane Terry, a composer John Cameron Mitchell deemed “the millennial Cole Porter.” Notably, they will be some of the first productions to be done at the venue’s newly renovated space on 1st Avenue. If you’ve been putting off going to this festival, try to pencil it in this year, as it’s the last time it will be happening. COIL will no longer be a part of the theater’s new vision under its new name of Performance Space New York, but there will be plenty of other programming. Some variety shows happen in bar back rooms, and because of that are more restricted to showing fare like music, comedy, storytelling, and so on. Variety shows at the dazzling House of Yes are a bit different. With high ceilings and a penchant for spectacle, shows and parties at this gilded Bushwick venue are chock-full of high-flying aerial performers, circus acts, and other eye-catching displays. 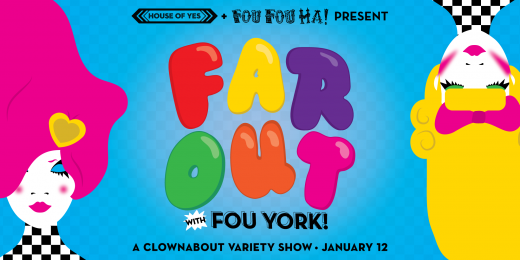 This show in particular is put on by Fou York, the East Coast division of Fou Fou Ha, a group of “saccharine disturbances to the status quo.” Expect clowns, burlesque dancers, “surrealist comedy,” and other varieties of wonderful and weird. 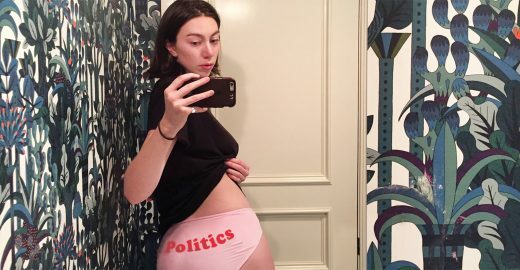 The promotional art for New Saloon and Milo Cramer’s Cute Activist is an image of company member Madeline Wise taking a mirror selfie that exposes her pink underwear with the word “politics” written on it in a jaunty font. You probably know someone who would do a thing like this non-ironically, and so do I. Cute Activist takes place in “mythical Connecticut” and centers around a gaggle of “part-time activists,” who presumably are the sort to wear politically-emblazoned apparel. We follow these so-called activists (and enjoy the odd musical number here and there, composed by Deepali Gupta) and wonder how one can productively engage in matters of politics and social justice, which is a truly valid inquiry in this day and age. It’s fitting that this story unfolds onstage—After all, what better place to delve into the topic of performative activism than the theater?